Tired of the same ol look? Want to give that laptop / PC a little bit of your taste but lack the tools and equipment to do it? Well Laptop Design USA has a process that you might want to look in to. 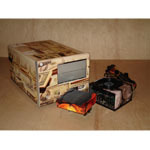 Laptop Design USA is relatively new company that was formed to brand companies' and organizations' laptop computers with their own colors, logos, and artwork. They have also branched out so that hobbyists, computer gamers, sports enthusiasts and others can brand their laptops, computer towers, and accessories. Nice Review Tazz, dont care much for the theme either but it's good work..
Ah the theme kind of grows on ya . I don't mind it. I definitely want to see more of what LaptopDesignsUSA has to offer though, I am very impressed with the quality of the product as well as the process they use . I am surprised we didn't get more comments on it . It just seems debilitating to me. I mean, who wants to mod a case when they had someone else custom print it, and just shelled out $100-$250+ for it. I know I wouldn't want to cut into it. That would be where you mod it first... Then send it to them to do . Can I send one piece to have this process done? Like, can I send my left side panel only? I am sure you can. I didn't directly ask that seeing that it would be un-common. I doubt they have a minimum limit though. Pricing as I stated on a case would vary depending on the design and on the parts being done. So the best thing to do would be to give them a call and go from there. We will dye-sub what ever part you want at long as it is metal. Does that include a metal fan? Ohhh...That would be a tricky one but I think we can pull it off. You have peaked my curiousity...that would be a tough one to do. I am gonna have to order a fan and get back with you on it.